Customers with a shipping address from outside the European Union are not subject to VAT, but are responsible for all potential duty, foreign sales- and import taxes of their country of origin. 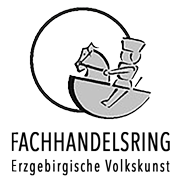 Potential duty, sales-tax and import-tax is not displayed during the sales process. For customers with a shipping address from outside the European Union prices will be deducted during checkout process. Due to German law we can not show prices exclusive VAT to public, but customers with a default shipping address from outside the European Union will see prices without VAT when logged into their customer account. PayPal offers convenient payments and is used by millions of ebay customers worldwide. You need a PayPal account to use this method. The account is free at paypal.com. PayPal offers payments by Credit card and bank accounts. After we have received the money we will start to work your order immediately. You can choose between Visa, Master Card and American Express. During the order process you will be asked to type in your Credit card information. We use a secure connection to give you maximum safety. In the case of this payment option, PayPal shall advise the customer's bank to collect the invoice amount from its account. This is the authorization procedure, in which the customer does not have to commission his bank. Pay now by card – Easy. Secure. Paid. With Pay now by card you can pay easily and securely with your usual online banking login data. After completion of the order you will receive an email, that gives you information on your order and our bank account. Please transfer the complete amount to our account and use the order number as information on the transfer. After we have received the money we will start to work your order immediately. International customers please note that all bank fees (i. a.) must be paid by customers. You pay the invoice amount to the postman. This payment method costs, in addition, 6.00 euros of COD charge. 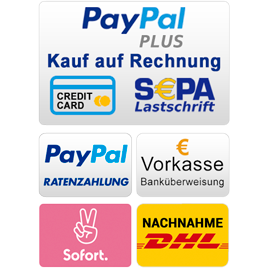 Please notice, this payment method is only possible by the dispatch within Germany.